1000 Best Solitaire Games (PC, 2000) - European Version. Condition is Brand New. Shipped with USPS First Class Package. 1000 Best Solitaire Games is a collection of more than 1,050 shareware and public domain card games. Although some games are played under Windows, others are played in a DOS environment. Individual games are either installed separately or come ready to run from the CD, all accessed from a drop-down alphabetical list of games available after installation. For shareware games that require registration after a trial period, a printable registration form is provided. Users can also enter personal comments regarding each game and view designer's notes as well. A search function is provided for locating specific games by author's name, description or keywords. A free membership in Cosmi Corporations' Solitaire Game of the Month Club is available through registration at www.cosmi.com, using a password supplied in the manual. Games in the collection range from traditional fare such as Klondike, Pyramid, and Canfield to more complex games like Cal's Brain Strain (a variation of Calculation Solitaire), Rummy Drop (a Tetris-type game with cards), and Beyond Pyramid (speed and skill). The collection even includes some titles that have been the subject of individually released games, such as the Burning Monkey series. item 2 1000 Best Solitaire Games (PC) Easy to Navigate Interface Locates Games Quickly! -1000 Best Solitaire Games (PC) Easy to Navigate Interface Locates Games Quickly! item 3 1000 Best Solitaire Games (PC) Easy to Navigate Interface Locates Games Quickly! -1000 Best Solitaire Games (PC) Easy to Navigate Interface Locates Games Quickly! 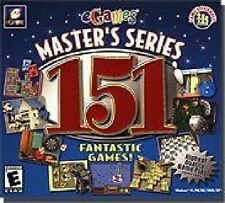 item 4 1000 Best Solitaire Games (PC) Includes Klondike, Canfield, Aces Up, & More! -1000 Best Solitaire Games (PC) Includes Klondike, Canfield, Aces Up, & More! I like because sooooooooo many different kinds of solitaire games. The price on the one that I purchase was very reasonable (also the postage). It is NOT a voilent games as most of the games coming out.It gives you an idea on how to play certain Solitaire games if you DO NOT have a computer near around OR people that DON"T believe in computers.